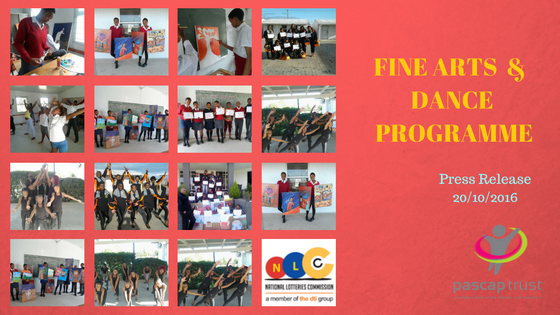 PASCAP Trust received support from the National Lotteries Commission to deliver our Fine Arts and Dance Programme to two communities in the Eastern Cape; namely, Nompumelelo and Cradock. The programme was developed to provide intensive skills development to talented youth from rural and township communities. There is a need for more art programmes in South Africa, especially in under-resourced communities where extramural activities are often not given enough importance. The aim of this programme was to provide learners aged 10-24 years with the necessary tools to explore their creative streak, which in return can be used in developing a career path and entrepreneurial independence. Fine Arts – In this part of the programme each beneficiary took part in 10 workshops where they learned the fundamentals of fine arts, the history, as well as the necessary theory involved. This was followed by practical lessons where resources were made available for the learners to create their own art pieces. These pieces are then often put on public display to showcase youth talent and made available for sale. Dance – the learners who participated in this programme received successive workshops specialising in Contemporary and African dance, Ballroom jive, and other different styles of dance. The learners were also given startup gear (e.g. ballet shoes, outfits) to keep and use even after the programme had ended. Through the programme over 40 beneficiaries were reached in the communities. The programme will continue to impact young lives in Graaff Reinet and again in Nomphumelo in this current quarter. I’m with you on that one Thuli, we definately need more art awareness out there. I’m glad I was part of the programmes.